Craig Miller, Managing Director at AluFoldDirect talks about why delivering outstanding service on aluminium glazing is the only way to help installers have the confidence to take full advantage of the growing aluminium market and build their businesses. You only need to flick through a trade magazine like Windows Active, to know that aluminium is being pushed to installers left, right and centre. From new design and innovations on existing products through to brand new system launches, aluminium is everywhere. And that makes sense, because it’s what the market wants. Walk through any city – any commercial building site will more than likely feature aluminium curtain walling and large commercial doorsets. Talk to any self-builder or home renovator – they don’t even think about PVC-U as an option for their glazing. Or look at upmarket new-build developments – aluminium is the material of choice for windows and doors. We know that the market is there, but we also know that, whereas installers can rely on their PVC-U windows and doors to show up when they need them to, they are often let down by the aluminium supply chain. That’s why AluFoldDirect was founded. I used to run a conservatory business and was so fed up with the lead times and let- downs on products like bi-fold doors that were key to me growing my business, I thought there must be another way. It turned out that there was. The new way that we created at AluFoldDirect has given installers the opportunity and the confidence to say yes to those aluminium jobs that they would have avoided before, because they never knew if, and when, the products would turn up. We started with bi-folds – delivered direct to site in an unmarked van, in 1 week unglazed, 2 weeks glazed. Not only did this offer the certainty and security of supply and delivery that installers needed, but the fast turnarounds meant they could order doors from survey, instead of plans so the install was much more straightforward. Installers loved it. They knew they could rely on us to get it right first time, every time. We took away the pain of buying and installing aluminium bi-folds but there were broader horizons out there. Secured by Design commercial doorsets and commercial windows were added – great for working on public sector and commercial projects like schools and hospitals that must stick to tight deadlines. We keep our 1 week unglazed, 2 weeks glazed delivery promise on these too. Then came Technic-AL, the range designed to completely blow away your customers. It was different to our other products because there was a heavy emphasis on the aesthetics. Self-builders and renovators want the complete package – a bi-fold, a stunning entrance, a rooflight to bring more natural light into extensions and windows to match everything else. The stunning RD1 entrance door came first. RD1 had the styles, colours and performance to have caused homeowners to make a beeline for it when they visited the Aluminium Glazing Design Centre. Our full aluminium roof lantern range came next – a great bit of kit that met the demand for a lantern that was easy to install and looked incredible. It can be installed in just 40 minutes and we deliver our 4 stock sizes next day. Next came the flat rooflight – brilliant performance and a stunning finish for a real modern, architectural finish – perfect for those flat roof extensions and contemporary renovations. They’re delivered next day too. The aluminium market shows no signs of stopping. We know the business is out there, and we also know that installers can be hesitant about making the jump. 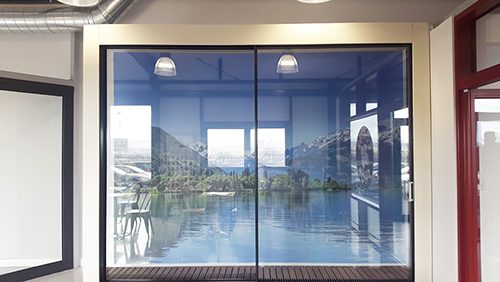 Our newest addition to our range, Infinium, minimal frame sliding glazing, led us to our latest innovation. It’s a stunning, world-class system, but to get it right, installers need to get certified by joining us for a free, one-day training course. We thought, if we’re doing it for Infinium, why not do it for the full range? So, installers who want to refresh their skills so that they have the know-how to take on bigger, more profitable aluminium glazing projects can get hands-on training at the AluFoldDirect Aluminium Glazing Academy and make the most of the opportunities out there.